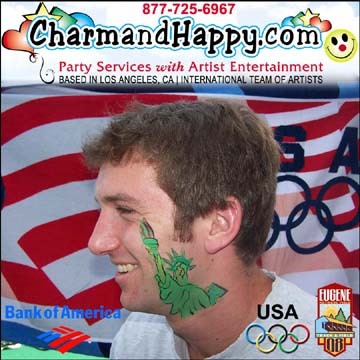 CharmandHappy.com in Eugene, Oregon for the Olympics Trials at the Bank of America Booth as we were face painters there. Carmen Tellez and another face painter from CharmandHappy.com had the honor of face painting guests at the 4th of July 2008 celebration for the Olympics trials in Eugene, Oregon. We had a long line for about 6 hours. I was told out of at least 125 booths that ours had the most guests at any given time just to get thier faces painted. Even the Oregon mascot Duck got his face painted. 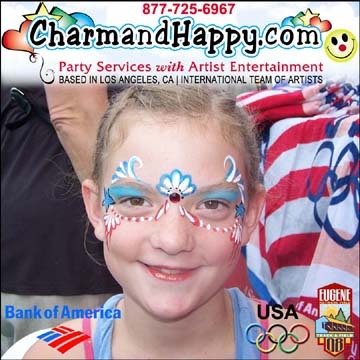 Visit AmericasCheer.com to see other guests at our booth Cheer for the USA Olympics Teams. You can also do a YouTube search for America's Cheer Olympics and find others. 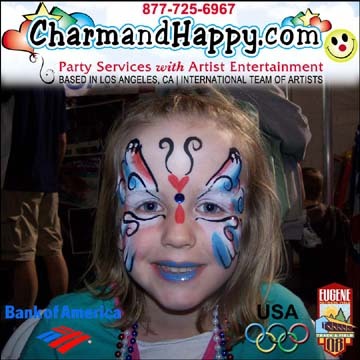 Let >CharmandHappy Face Painter SoCal.< be your choice for the perfect Face Painting at your private party, corporate event, or special occasion. 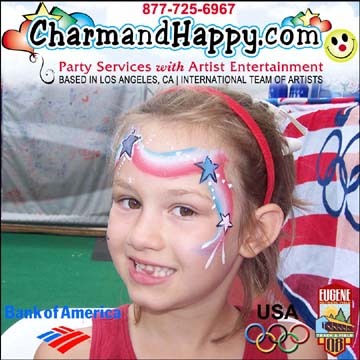 >CharmandHappy Face Painter SoCal.< will travel nationwide and international from Whittier, CA. 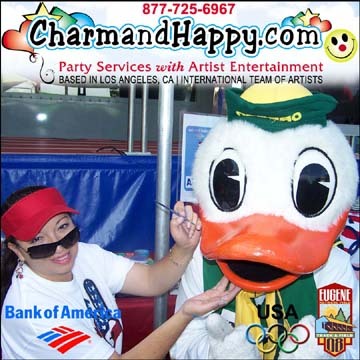 CharmandHappy.com is proud to announce that our team members are also based in most major cities. $185 - $250 basic 2hrs. $325 - $625 specialty 2hrs. Snazaroo Gary Cole, Marcela Murad, Jinny G. with Mehron Paradise, Ginny Colangelo with GincProductions, Nick and Brian Wolf Brothers, Mr. Rivera (8th grade Art Teacher) can't forget him. 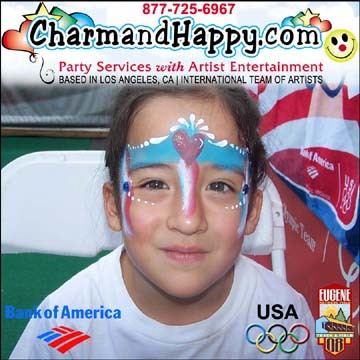 Carmen Tellez & professional team utilize only the best quality theatrical make-up available. Transforming children and adults into their favorite character, fantasy look or monster has been my Artist motivation since 1994. Unforgettable smiles on every painted face keeps us loving our art. Themed balloon decorations. 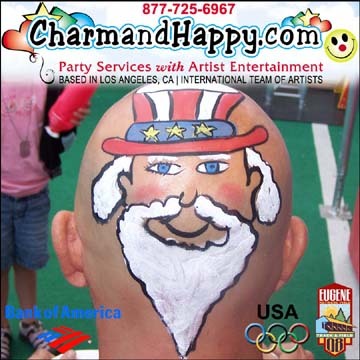 I am fortunate and honored to have been on the face painting team of some the greatest face painters world-wide. 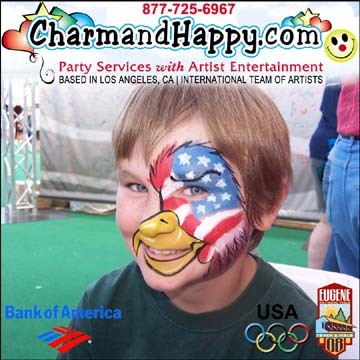 And my own face painting team has been selected to paint for Animal Planet's Family Pet Expo, Alaska State Fair, several Sports Venue, Many schools, and several hundred cute birthday parties. High profile clients including celebrities are also on my schedule list. Most popular faces include Spiderman, Batman, Princess Ariel, Cinderella, bird face, fancy curls and swirls, hearts, ribbons, skelatons, butterfly face, tiger face, clown faces just to name a few. At the KISS Concert I was hired to paint at, mostly every one wanted me to paint them as the Gene Simmons demon. So the choice is yours and the possibilities are endless. 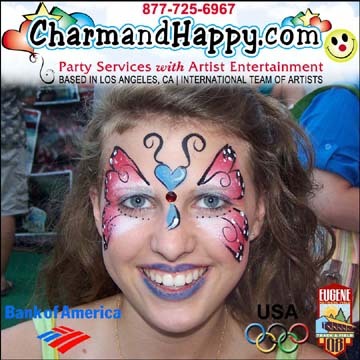 Carmen Tellez & face painters team available in these cities. As mentioned above, we do travel and do have out of area team members. Artesia, Lakewood, Hawaiian Gardens, La Palma, Norwalk, Bellflower, Buena Park, Cypress, La Mirada, Long Beach, Los Alamitos, Santa Fe Springs, Downey, Fullerton, Garden Grove, Paramount, Whittier, Anaheim, Stanton, La Habra, Huntington Beach, Newport Beach, Pico Rivera, Whittier, Commerce, Montebello, Signal Hill, Bell, Bell Gardens, Stanton, Brea, San Gabriel, Alta Dena, Pasadena, Studio City, Beverly Hills, Westwood, Brentwood, Gardena, Hawthorne, San Pedro, Rancho Palos Verdes, Manhattan Beach, Malibu, Inglewood, Compton, East L.A., Los Angeles, Garden Grove, Santa Anita, West Covina, Covina, La Puente, Baldwin Park, San Bernardino, Rialto, Rancho Cucamonga, Anaheim, Orange, Laguna Hills, Mission Viejo, Irvine, Duarte, Corona, Yorba Linda, Colton, Loma Vista, Inland Empire, El Monte, Rosemead, Temple City and surrounding areas. "Everyone looked great! 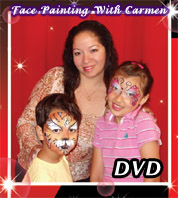 I can't believe how many happy parents there were and all beccause thier children were enjoyed thier face paintings. I was one of the people that you did the face paintings on. Thanks for the painting it was really nice i got a lot of compliments on it." - No art experince needed! - Learn sponge techniques and sponges used. - Learn about the different brush techniques and brushes used. - Learn the differences in make-up. 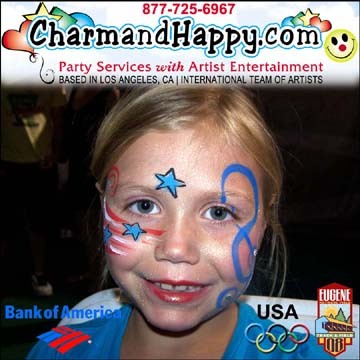 Bring your party to life with color, paint, imagination and personality!